“The third year is fatal” said Bela Guttmann, with regards to managers, cited often enough that it is has fallen into the football manager’s psyche. The dressing room loses respect for the manager. The manager gains an affinity for certain players above others, form or class aside. Opposition figure out how to deal with any tactics or innovations the manager initially brought to the table. Pep Guardiola, arguably the crafter behind one of the greatest teams of all time, is constantly on the verge of quitting the Barcelona job every summer. Last year, after winning the Liga BBVA and the Champions League once again, most in the media were gearing up for his departure. It therefore comes as little surprise that a mere month after his three month anniversary at the club, Simon Grayson, now ex-manager of Leeds United, has left Elland Road. Last night (31st January 2012), Leeds United capitulated at home to Birmingham, losing 4-1 almost single-handedly to a striker who has only scored 8 goals this season. This despite the fact that reports from the ground suggested that the first half performance was one of the best Leeds have had for a long while. This is the truth of the latter part of Simon Grayson’s reign. This season, and during the back-end of last season, Elland Road has not been a particularly wonderful place to watch football. There was a moment a week and a half ago, as Leeds played Ipswich, that one felt Grayson had lost anything that he may once have had. The day was windy, and any manager with slight tactical nous would have recommended the ball remain on the floor. Any ball sent upfield by goalkeeper or defender would get caught in the wind. Yet Leeds came out of the tunnel and, like most performances this year, the strikers found themselves confined to challenging defenders in the air. Admittedly, Leeds managed to win the match 3-1, but this was exclusively due to the capitulation of the Ipswich back line, and the granting of a red card to his former team by usually sturdy goalkeeper Alex McCarthy. Fans driving away from the ground last night would be caught up in a temporary surge of optimism, but by the time the radio phone-in had begun, it was clear that the fans’ discontent had not been assuaged by the result. There were clear faults with Grayson’s approach in their eyes. This is the man, however, that lead Leeds United to Old Trafford as a League One side, and won. 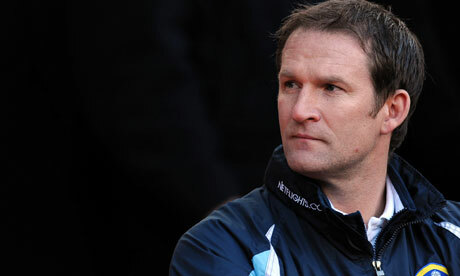 This is the man, however, that lead Leeds United to White Hart Lane as a League One side, and managed to take a draw. This is the man, however, that lead Leeds United out of said League One. A manager who achieves these results is clearly not bad at his job. Managing players of the quality at his disposal to a victory against Man Utd takes an incredible amount of tactical and motivational awareness. This is why it becomes hard to countenance his sacking. Clearly the ability is there, and somewhere along the way he has lost it. Rumours have emanated from Elland Road for the past year or so that Grayson has lost the dressing room. The manner in which he freezes out players after a single bad performance, leading to them rotting in the reserves, and never getting an appearance in the first team no matter how much they are suited for the job necessary, is clearly not conducive to a harmonious club. Word that Grayson’s affair, reported in the red-top media, led to him losing favour with Ken Bates and Bates’ wife was rife. The manner in which Grayson dealt with Andy O’Brien, chastising him and saying he would never play for him again, yet back-tracking when depression turned out to be at fault for his refusal to play again for the side, revealed plenty about how Grayson worked with his players. This might be where Grayson, the man who did so well for Leeds a mere two years prior, fell down. As Guttmann said, the third year is fatal, and particularly key to Grayson may be the thoughts the dressing room had about him towards the end. Leigh Bromby’s wife posted on Facebook immediately after the sacking that it was “karma”, and simply said “good riddance”. Bromby clearly brought work back home with him. The ability was, therefore, there at one point, but it has since been lost. This is why Leeds fans have hung onto positivity towards Grayson, despite the falls. It must be said that Grayson could probably sustain success for longer under a Chairman that does not treat the playing side of the club with such contempt. Grayson, however, in the end, is to blame, possibly for not leaving earlier. His replacement, awash with innovation, will probably get more out of a team of players coveted by Premier League sides. The real shame to Leeds fans that remember the football played in the early days, is that Grayson simply did not learn the lessons of Guttmann. Follow Amitai Winehouse on Twitter.